Home Basketball "Doncic does not need speed or strength, he has them in his head"
"Doncic does not need speed or strength, he has them in his head"
The exazulgrana and current player of the Knicks surrendered before the level that is showing Luka Doncic. He also recognizes that he prefers the NBA to European basketball. Mario Hezonja was pronounced on the impact of Luka Doncic in his first months in the league. 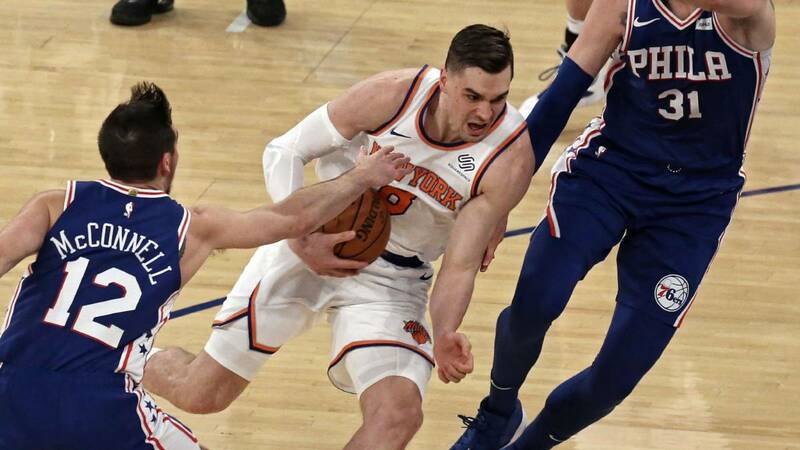 He did it in the first training session of the New York Knicks in London, where on Thursday they will play the Washington Wizards in a new edition of the NBA London Game. "In Luka's case, he does not need the speed and physical strength that the NBA demands, because he has them in his head. After all, basketball is played with the head, right? Play as if you were 35 years old, it's incredible. That's why, if you know how to play in Europe, you can play wherever you want. And he is showing that he can play at the highest level ". The Knicks forward also thanked the contribution of his teammates and coach Xavi Pascual during his time at Barça." As a young man in Barcelona, he had great players with me to learn from them and a great coach in Xavi (Pascual) to teach me things I could do at a great level. It was hard at that time, because I came from Croatia where I did a little bit what I wanted and they taught me what I expected in the NBA. " Hezonja was also" proud "of being able to represent the NBA in Europe in this new edition of NBA London Game: "It's my third time here. My first time in London was 16 years to play the Jordan Brand Classic and for me it was incredible. It's a dream for a child to be able to see NBA players live, and now to be on the other side ... it's a pass "
Finally, the Dubrovnik player admitted that he prefers NBA basketball to that practiced in Europe. International dropped his opinion, while extolling the adaptation that many Europeans are having to a faster and physically demanding game style. "I prefer the NBA. Even so, there are many European players that are coming to the NBA and it shows that they are improving a lot. The time to train and learn concepts in Europe is greater, so their players can also be at the same level as the NBA " , admitted the former FC Barcelona player, who is not surprised by the growing number of foreign players in the US league. 2 "Not at all, some may need a little more time, but you have to be patient, and know how to adapt to the speed and strength of his game ".